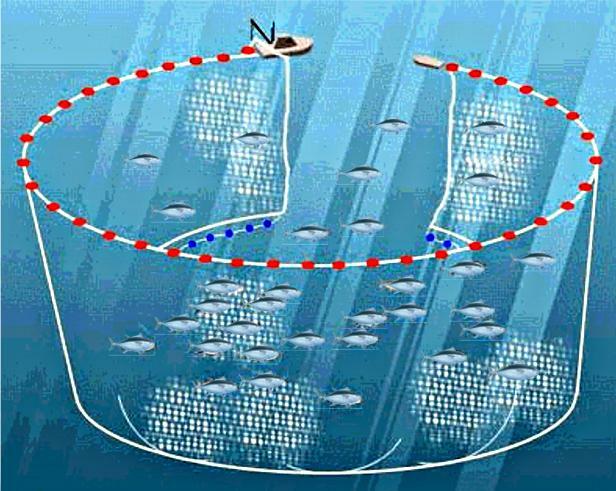 Purse-seine fishing vessels use long nets, approximately one mile in length, to encircle the tuna. These nets are closed off by drawstrings much like a drawstring purse. In the case of tuna farming, the objective is to capture and transfer live tuna. Hence, the net is not fully drawn while the fish are enclosed. The purse-seine net is drawn only until it equals the towing pen circumference of 132 meters. At this point, the purse-seine net is attached to the towing pen and the live tuna are transferred from the purse-seine net into the towing pen. This procedure permits the successful release of live by-catch and excess tuna. All fishing and transfer methods described above adhere to the EUROPACIFIC TUNA LTD dolphin-safe policy.